Loafing about. – Greenwich Village Vegan. For me Sunday has become a day that has developed a reassuring and comfortable routine to it. I no longer get that dreaded “back to school tomorrow ” feeling that can still haunt us in our adult life. We get up a little later, I make Vegan scramble for breakfast with lovely strong black coffee, and then I pfaff about in the kitchen looking through cookery books and notes and recipes I have written, deciding what I am going to bake or cook later. This is my little Sunday morning ritual and I suppose this is Hygge for me. If I am super organised I will bake this banana loaf before we go out for a walk, then we come home to that wonderful smell of baking and cinnamon. Sometimes I jazz it up with dried fruit, raisins, apricots or sometimes maraschino cherries. It’s delicious eaten as it is or toasted, it usually lasts until the next Sunday, just in time for me to whip up another one! Because it’s not really a cake, or a bread I have decidd to simply call it a loaf. So there. 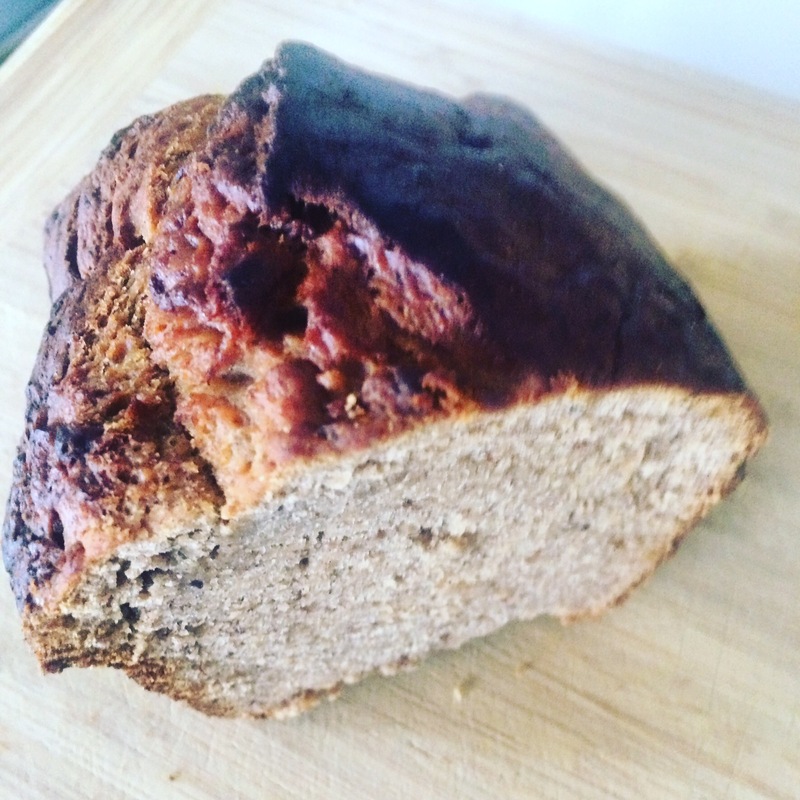 By accident last week I mistook Coconut flour for coconut sugar (should’ve worn my gogs!) thinking I was using the measurement half and half with caster sugar, the dough took on a totally different consistency in the bowl, almost foamy as if it was proving like bread? And whilst it also didn’t rise nearly as much as when I didn’t add the wrong ingredient it did seem to be lighter in texture after baking? Or was that because I added more raisins as well? Ah well therein lies the alchemy of cooking….. If you’re feeling fruity add Raisins or Cherries or Apricots, whatever floats your boat, a good quantity so they will evenly distribute through the mix. Sift the flour and baking powder in along with the sugar and the dried fruit of your choice and mix really well again until every thing is all nice muddled together. Pour into your loaf tin and bang the tin a couple of times on a flat surface to level it and get rid of any air bubbles. Bake for 30 minutes then cover the top with baking parchment or foil and bake for another 20 minutes or so or until a knife comes out clean. When it’s completely cool turn it out on to a rack to completely cool all through. Enjoy immediately or wrap in foil until you eat it. NB. I have just tried it with some crunchy peanut butter and it tastes awesome! Previous Post How do you Hygge? Next Post Namaste New Year. Wow!! 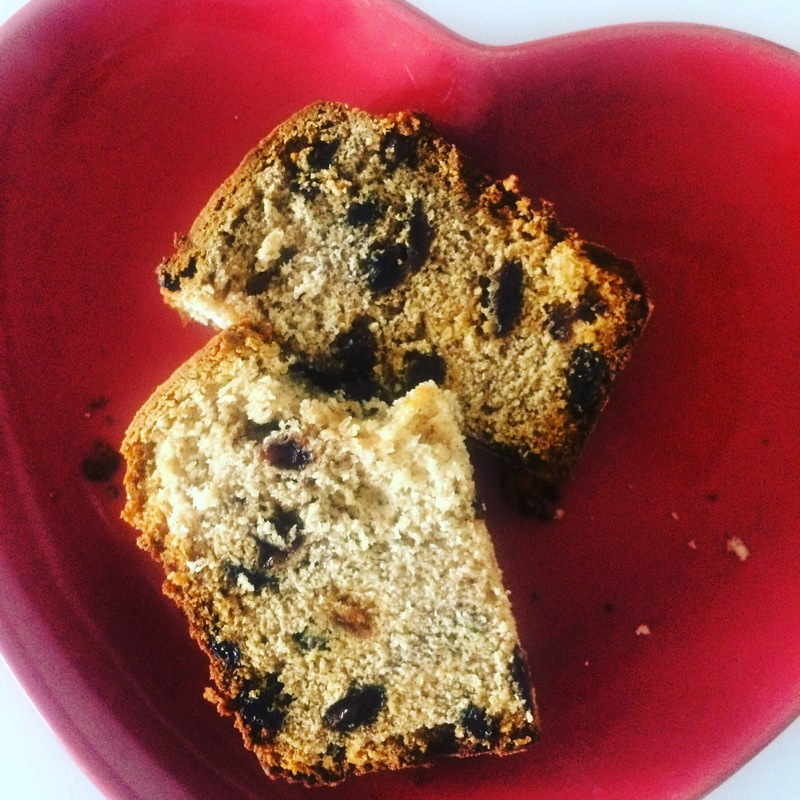 It’s so funny, I made a banana bread during the week that for some reason just would not bake in the middle, it’s such a coincidence that you are writing about it! I don’t know what happened!! So I had to sadly throw it away and then tried another the next day, it was better but it didn’t rise as well…..I think my first attempt was too oily, I also cook with rapeseed oil. This week when the remaining bananas in my fruit bowl are starting to become over ripe and I reach for the loaf tin again, I am going to use your recipe! Hello Sam! Thank you so much for reading my recipe! I hope it works for you! Do let me know how it turns out. It’s so frustrating when things don’t work isn’t it? I have had my fair share of disasters in the kitchen let me tell you! I have another recipe which I will put up soon, with coconut flour which is really yummy!